Zwei Jahre Freihandel mit den USA – ohne Umsetzung des Schutzplans für Arbeitsrechte! In diesen Wochen wird in Deutschland und der EU über ein fast identisches Freihandelsabkommen mit einem ebenso ähnlichen Schutzplan für Menschen-, Arbeits und Umweltrechte abgestimmt. Die Erfahrungen aus den USA zeigen, dass unverbindliche Willenserklärungen wenig nützen…. For decades, Colombia has witnessed painfully high levels of anti-union violence; in 2012, the most recent year for which there is data, Colombia remained the most dangerous country in the world for trade unionists. Despite the labor violence and lack of labor protections, Colombia and the United States have pushed for a free trade agreement (FTA) between the two countries. To assuage U.S. Congressional and labor concerns, Presidents Barack Obama and Juan Manuel Santos launched the U.S.-Colombia Labor Action Plan (LAP) on April 7, 2011. The LAP commits both countries to guarantee major labor rights changes in Colombia. Two years later, we see institutional and normative developments, such as the creation of the Ministry of Labor and hiring of labor inspectors, but few results guaranteeing workers rights to association and addressing efforts that regularly undercut direct contract in the LAP priority (palm oil, sugar, mines, ports, and flowers) and other sectors. Trade unionist killings have gone down, but new unionists continue to be killed and security remains a top concern and a lack of justice in such cases remains the norm. Two years after the U.S. and Colombia promised positive advancements to Colombias labor sector, little change is seen on the ground: According to Colombias National Labor School (ENS), at least 20 trade unionists were killed for their work in 2012, and 431 threats were recorded. -The death threat circulated on April 1, 2013 was the 991st to be received by the labor movement since President Juan Manuel Santos took office in June 2011. -Only four percent of workers in Colombia belong to a union, largely due to violence and fear of reprisals from employers. -Despite requirements by the LAP to end the process of sub-contracting, employment continues through cooperatives with new names such as Simplified Stock Companies (SAS). Reprisals against workers attempting to unionize remains rampant and mass firings are commonplace. -Over 90 percent of cases of violence against trade unionists do not reach a conviction. Emblematic of the labor rights situation in the sugar sector, the first unionist murdered in 2013 was a SINTRAINAGRO union organizer from the Las Cabanas sugar mill. The mill­like many in the lucrative sugar industry­regularly fires union workers for organizing and has ignored calls for it to implement the LAP by directly employing all of its 2,500 workers. Prior to the murder, the company had fired the entire Board of Directors of the local union, and had forced hundreds more to leave for fear of reprisals. Much of this sugar is now going to the U.S. due to the FTA, the U.S. Trade Representative reports. In the port sector, subcontracting continues unabated; over 80 percent of workers do not have a direct contract with their employers. While commercial activity is increasing in the port city of Buenaventura, Afro-Colombians, who are the majority, confront grave violence, displacement, and live in abject poverty amidst widespread criminality. The oil sector is confronting major obstacles to direct contracting and respect for union organizing. According to the Unión Sindical Obrera (USO), Colombias oil industry union, subcontracting is approximately 80 percent, as companies use third party contractors to evade domestic and international labor laws. Intimidations against union leaders are widespread, especially in the Meta region. In November 2012, state and private security forces denied union representatives and a Colombian Senator access to the over 10,000 oil workers in the Campo Rubiales oil field. While the Labor Action Plan is a roadmap for positive change towards labor rights protections in Colombia, it has yet to become a reality. Strong labor laws on paper must be translated into decisive action on the ground. This requires that Colombia increase its political will to investigate and prosecute labor violations to the fullest extent of the law, especially when confronting entrenched economic interests. The United States must urge Colombia to fully implement its labor laws, guarantee that labor inspectors are doing their job, and insist that impunity be decreased and protections for labor organizing be increased. On the second anniversary of the LAP, the United States must demand that Colombia provide tangible progress­not just plans. 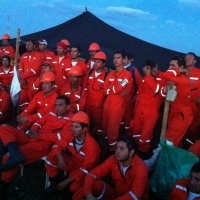 Photo: Oil workers in Meta, Colombia. ← Offener Brief an die Mitglieder des Deutschen Bundesrates: Freihandelsabkommen der EU mit Kolumbien und Peru ablehnen!